In a recent post I discussed the orthodoxy and vibrant Catholicism found in the Diocese of Lincoln, Nebraska. As I touched upon within the article, the ongoing vocations boom in Lincoln is one of the more visible signs of the health and authenticity of the faith there. Though written a few years ago, I have just started reading Renewal: How a New Generation of Faithful Priests and Bishops is Revitalizing the Catholic Church by Anne Hendershott and Christopher White (Encounter Books, 2013). In great detail, with both empirical and anecdotal evidence, the authors demonstrate how it is indeed orthodoxy that is leading to the resurgence of the faith, and priestly vocations, in many dioceses. Make no mistake about it though: today’s shortage of priests is the inevitable result of an intentional attack against orthodoxy a generation ago. Early in Renewal we are reintroduced to a very powerful article written in 1996 by Archbishop Elden Francis Curtiss of Omaha, Nebraska. The (now emeritus) archbishop argued two decades ago that there was never a vocations crisis within the Church, but rather a crisis in orthodoxy. His bold admonition reverberates to this day. As documented by Hendershott and White in Renewal, it would seem that an increasing number of current bishops have thankfully taken Archbishop Curtiss’s words to heart. However, as the ecclesial tone has changed the last few years, and a spirit of liberalism has once again reasserted itself, we are seeing a false dichotomy presented which pits orthodoxy against mercy. Now more than ever we need to proclaim the necessity for authenticity. The words below are as relevant today as they were twenty years ago. “There is much media hype these days about the present and projected shortage of priests and its effect on the sacramental life of the Church. It is time to pay close attention to the dioceses and religious communities reporting increasing numbers of candidates. There have to be reasons for these increases that bear objective analysis from which some conclusions can be drawn. “I personally think the vocation “crisis” in this country is more artificial and contrived than many people realize. When dioceses and religious communities are unambiguous about ordained priesthood and vowed religious life as the Church defines these calls; when there is strong support for vocations, and a minimum of dissent about the male celibate priesthood and religious life loyal to the magisterium; when bishop, priests, Religious and lay people are united in vocation ministry-then there are documented increases in the numbers of candidates who respond to the call. “It seems to me that the vocation “crisis” is precipitated and continued by people who want to change the Church’s agenda, by people who do not support orthodox candidates loyal to the magisterial teaching of the Pope and bishops, and by people who actually discourage viable candidates from seeking priesthood and vowed religious life as the Church defines the ministries. “I am personally aware of certain vocation directors, vocation teams and evaluation boards who turn away candidates who do not support the possibility of ordaining women or who defend the Church’s teaching about artificial birth control, or who exhibit a strong piety toward certain devotions, such as the Rosary. “When there is a determined effort to discourage orthodox candidates from priesthood and religious life, then the vocation shortage which results is caused not by a lack of vocations but by deliberate attitudes and policies that deter certain viable candidates. “And the same people who precipitate a decline in vocations by their negative actions call for the ordination of married men and women to replace the vocations they have discouraged. They have a death wish for ordained priesthood and vowed religious life as the Church defines them. They undermine the vocation ministry they are supposed to champion. 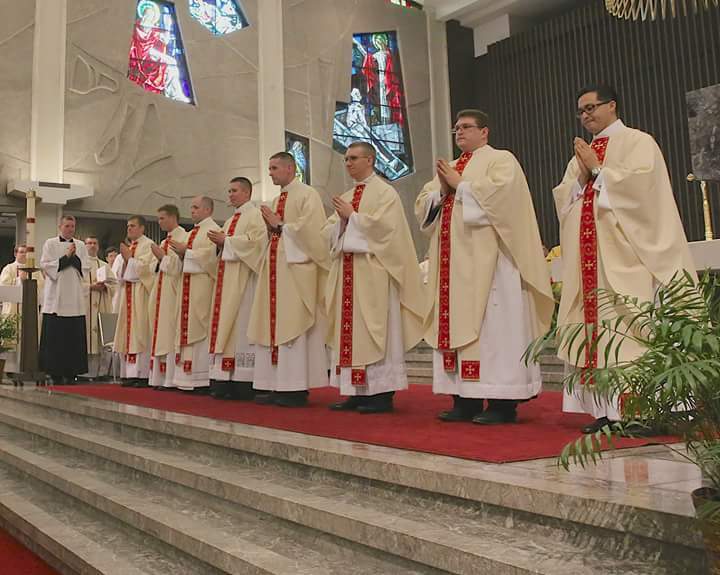 “An article in the Catholic World Report (May 1995), by Michael Flach, analyzes the remarkable increase in vocations to priesthood in the Arlington, Va., diocese. “Father James Gould, diocesan vocation director, explains the reasons for their success: unswerving allegiance to the Pope and magisterial teaching; perpetual adoration of the Blessed Sacrament in parishes, with an emphasis on praying for vocations; and the strong effort by a significant number of diocesan priests who extend themselves to help young men and women remain open to the Lord’s will in their lives. “I see this formula for success in vocation ministry in our neighbouring Diocese of Lincoln, Neb., which has 45 seminarians preparing for the priesthood and a significant number of young priests at work in a largely rural diocese with 84,000 Catholics. “In the Archdiocese of Omaha, I am encouraged by the dynamic thrust for vocations to the priesthood and religious life that is present. We will have at least 36 seminarians next fall, 28 in pretheology and theology, with clear indications of increases in the coming years. “Our vocation strategy is drawn from successful ones in other dioceses: a strong orthodox base that promotes loyalty to the Pope and bishop; a vocation director and team who clearly support a male, celibate priesthood and religious communities loyal to magisterial teaching; a presbyterate that takes personal ownership of vocation ministry in the archdiocese; two large Serra clubs in Omaha that constantly program outreach efforts to touch potential candidates; more and more parents who encourage their children to consider a vocation to priesthood and religious life; eucharistic devotion in parishes with an emphasis on prayer for vocations, and vocation committees in most of our parishes that focus on personally inviting and nourishing vocations. “I am convinced that shortages of vocations in any part of the country can be reversed by people who share enthusiastically in the agenda of the Church. We have to learn from the dioceses and communities who are experiencing an increase in vocations. “If we are not willing to recognize and accept the reasons for their success and incorporate them into our own local efforts, then we allow ourselves to become supporters of a self-fulfilling prophesy about the shortage of vocations because we fail to take advantage of the opportunities that we have for increasing the number of candidates for the priesthood and vowed religious life. “Young people do not want to commit themselves to dioceses or communities that permit or simply ignore dissent from Church doctrine. They do not want to be associated with people who are angry at the Church’s leadership or reject magisterial teaching. They do not want to be battered by agendas that are not the Church’s, and radical movements that disparage their desire to be priests, Religious or loyal lay leaders in the Church. “The dioceses and religious communities that promote orthodoxy and loyalty to the Church; the ones that mobilize priests and people to call young men to the ordained priesthood despite the opposition of those who rail against a male, celibate priesthood; the ones that want their members to be real churchmen and churchwomen that are committed to prayer and holiness as a primary requisite-these are the dioceses and communities that will enjoy increasing numbers of candidates and will disprove the forecasts of decline in vocations everywhere in the Church because of their successes locally. “The need today is for strong leadership in vocation ministry: bishops willing and able to confront dissent that weakens support for vocations; vocation directors and teams loyal to the magisterial teaching of the Church regarding ordained priesthood and vowed religious life; presbyterates and religious communities willing to call forth candidates who share their loyalty to the Pope and bishops and the agenda of the Church; faithful lay people willing to constantly pray for vocations and support them at every turn. “When this formula, based on total fidelity to Church teaching, is followed in dioceses and religious communities, then vocations will increase. Present statistics support this premise. This is the reason there will be dioceses and religious communities that will have adequate numbers of priests and Religious in the future. The full article by Archbishop Curtiss is available to read here. Photo: Lincoln diocese Mass of Ordination (2015). Posted on May 7, 2016, in holiness, life and tagged anne hendershott, archbishop elden curtiss, orthodoxy, renewal book, vocations crisis. Bookmark the permalink. 8 Comments. I would be remiss not to add that Michael Rose’s “Goodbye, Good Men” is once again available (in e-book format). His study of the rampant heterodoxy and homosexuality present in American seminaries in the post-conciliar years is most relevant to this discussion. I think it was St. Alphonsus Ligouri that said 1 in every 3 (or 4) souls has been given a vocation to the religious life be it a call to be a nun, brother, or priest. If we don’t foster an environment where people are living a good and holy life and are willing to see if they have a vocation then all those vocations are wasted, not because they didn’t exist, but rather because they were ignored. Here’s an idea…. Drop the celibacy and see what happens! If we don’t try it, we will never know if it will work. Again, as I have stated elsewhere, in amost all of Christendom, including our Eastern rite churches and Anglican use parishes, the Roman Catholic Church stands alone not allowing, by and large, a married clergy. Face it folks, most guys aren’t all that interested in living a celebrate lifestyle any longer, if they ever were. Here’s an idea Jay, read the post again. Your solution isn’t one. You miss the very point that Archbishop Curtiss is making, an argument confirmed by both empirical and anecdotal evidence. Orthodoxy is the solution. The truth attracts. Always had, always will. I live in the Diocese of Lincoln where, as elsewhere, celibacy is a requirement Jay and vocations are flourishing. It is so plainly evident, isn’t it, that it is only in those dioceses that adhere to orthodoxy and traditional Catholic practices and devotions, where the family (the domestic ‘church’) faithfully lives these values, that religious vocations are born and fostered. Crazy progressive parishes that embrace every type of novelty, are simply ‘shifting deck-chairs on a sinking Titanic’. Celibacy for the ordained priesthood of the Roman Catholic Church is the most wonderful of gifts. This total self-giving of a young man who rallies to God’s call to become an alter Christus knows no comparison in other Christian communities, whose ministers are pre-occupied with their wives and kids and place their vocation to lead souls to Christ in second place. Celibacy is challenging and requires great sacrifice, but for that very reason it likens the priest so closely to Our Blessed Saviour. Priestly celibacy is mystical, unique, beautiful and holy. Worldly Modernists cannot understand it, while the devil’s minions do all in their power to destroy it. May we pray without ceasing to protect our priests from the snares of the devil (so many who are now ‘the enemy within the gates’ of the Church) and for God to send us more and more good and holy vocations. Oops! The “enemy within the gates” I mentioned was not referring just to priests, but to all those (some who might happen to be priests themselves) who work for the devil and out to destroy priestly vocations. This is worked either through those who have embraced the evils of Modernism and secular thinking, or through trying to lead priests and seminarians into temptation.